Why Do You Have to Drink So Much Water When Taking Tetracycline? Tetracycline is an antibiotic that is used to prevent the spread of bacterial infections -- such as the bacteria that cause you to develop pneumonia or a respiratory tract infection. The medication also is used to treat acne because severe acne results when bacteria invade the pores. Tetracycline is a powerful antibiotic. To minimize its side effects, your physician will recommend drinking a glass of water each time you take your antibiotic. One of the reasons you should drink water when taking tetracycline is that the drug can be irritating to the esophagus. The esophagus is the tube that runs from the mouth to the stomach. The esophageal lining is less strong than the stomach lining, meaning it is prone to irritation from the medication. By drinking water as you take antibiotics, you can minimize pain as the medicine goes down. Drinking water also prevents development of ulcers in your esophagus. If the pill becomes lodged in your esophagus because you have not had enough water to wash it down, you may develop esophageal ulcers. Prevent this by taking a few sips of water to coat your esophagus before you take the medication. Continue to sip the water after taking the medication; the additional water will prevent the tetracycline from being lodged in your throat. One side effect of tetracycline antibiotics is increased thirst. By drinking a glass of water when taking tetracycline, you can reduce the likelihood you will experience this symptom. 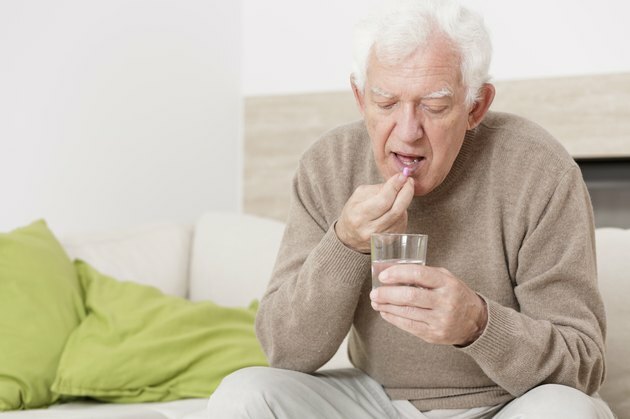 You may find you need to drink even more than a glass of water after taking the antibiotic to reduce dryness or soreness in your mouth and throat. Common side effects of tetracycline include diarrhea and difficulty swallowing. Drinking water can help to minimize these side effects. Diarrhea can have a dehydrating effect, so the water helps to alleviate this. Water also can reduce swallowing problems by coating the throat. To minimize stomach upset, take the medication one to two hours before eating. Drinking plain water with the medication is best. Milk and liquids that have magnesium or iron can reduce tetracycline's effectiveness. If you have trouble drinking plain water, ask your physician for recommendations. If your stomach is severely affected by the medication, your physician may recommend taking tetracycline with small amounts of bland foods. What Are the Side Effects of Natrilix SR?